SSC Important Notice Regarding OBC Certificates. Candidates may refer to the provisions in the Commission’s earlier Notices of various Examinations, which inter-alia prescribed that the OBC Certificate in the prescribed format issued within Three years, before the last date of receipt of applications and up to 180 days after the closing date of applications would be accepted by the Commission. 2. It has been observed by the Commission that the candidates were facing difficulties in producing the OBC Certificates in the prescribed format within the cut off date specified in the Notices. Some of the candidates had also challenged the above provisions in various Courts. 3. Keeping in view the difficulties faced by the candidates and the Order of Hon’ble Supreme Court in SLP No. 3116/2017 in the matter of Union of India vs Abdul Rasheed, the Commission took up the matter regarding relaxation in the stipulated time limit (as indicated at para 1 above) with the Department of Personnel & Training. (i) With effect from 23.01.2017, [i.e the date of dismissal of SLP No. 3116/2017 filed by the Commission in the Hon’ble Supreme Court of India (UOI vs Abdul Rasheed)] the Commission will not insist on candidates producing OBC Certificates issued within the cut off dates i.e. 3 years, before the last date of receipt of applications and up to 180 days after the closing date of applications mentioned in the Notices. (ii) In cases where document verification has already been completed and the final result was declared after 23.01.2017 or is yet to be declared, the candidates may furnish prima facie proof of being OBC, if already not produced, to enable the Commission to consider/process their claim under the OBC category. 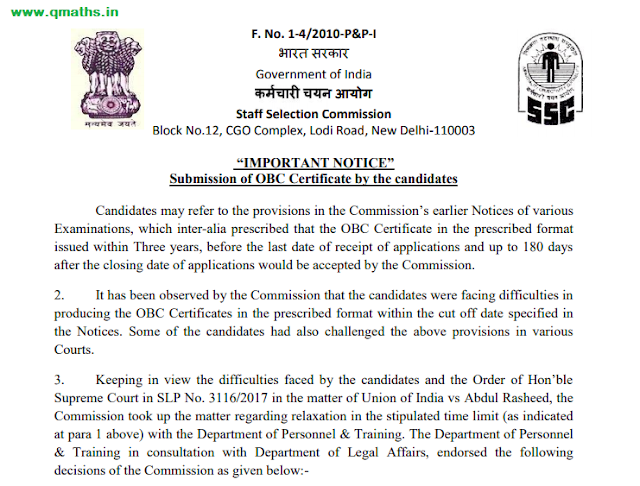 (iii) The candidature of OBC candidates will remain provisional; subject to verification of his/her claim by the User Department concerned as Appointing Authority, as per the extant Government provisions/guidelines on the subject. (iv) It is categorically stated that the Commission shall not reopen cases where the final result has already been declared before 23.01.2017.